Hand-made pottery was already becoming an economically marginal craft in the 1870s and 1880s with the rise of factory potteries, particularly in Ohio, that were capable of producing large quantities of inexpensive ceramic wares of all types. Nonetheless, the Medingers continued to build a strong local business based on well-designed and well-crafted utilitarian wares, supplementing their living from the pottery by cultivating a 35-acre farm, operating a cider press, and harvesting ice to sell to their neighbors for refrigeration in summer. While some historians think it’s likely that the Medingers engaged in some pottery making from their arrival in the 1850s, others date the pottery’s operation to 1872. It’s possible that in 1872, when Jacob would have been 16 years old, the pottery simply took on a more business-like structure or that with his additional assistance, father and son were able to make potting a larger part of the family’s income. Regardless of the timeline, the Medingers were known to have produced a range of the utilitarian wares their neighbors needed, including apple butter crocks, milk pans, mixing bowls, jugs, jars and pitchers. They also kept busy turning out underground drainage pipes, stove pipe guards, and roof tiles. In 1903, William Medinger died, leaving the family business to Jacob, then a 46-year-old family man with a wife and five children, and Jacob proved himself an ambitious man who was willing to adopt new methods, such as the steam engine added in 1905, in order to improve the business. He also sought to expand his market area by hitching up a team of horses to a wagon filled with the pottery’s products and traveling further afield to places like Pottstown, Royersford and Phoenixville, selling his wares out of the back of the wagon as he went along. Eventually the pottery’s reputation grew so strong that these peddling activities became unnecessary. Of course, during this same time, the larger factories that had been eclipsing smaller potteries for several decades were also implementing the same technological advances, and their outputs were skyrocketing. In order to survive, Jacob began making decorative plates, chargers and bowls, often custom decorated for individual presentation. In making these pieces, Jacob followed both the designs and color palette of Pennsylvania Dutch potters working in the late 18th and early 19th century and the decorative arts traditions brought by his father from Germany. Perhaps Jacob’s finest works at this time were sgraffito-decorated pieces on which designs of birds, tulips, hearts, and figures were scratched before a second firing was given to the piece. The demand this this finely crafted and decorated earthenware became so great that Medinger formed a partnership with a local woodcarver, William McAllister, to help design the decoration on these sgraffito wares. The partnership was a success and allowed the number of decorated plates produced for sale to be increased, allowing the pottery to continue operating successfully until 1932. In March of that year, Jacob died at 76 after receiving severe burns when his clothing caught fire as he was adding wood to a kiln. Although Jacob Medinger and his business are now gone, much of what he produced in his later years survives. 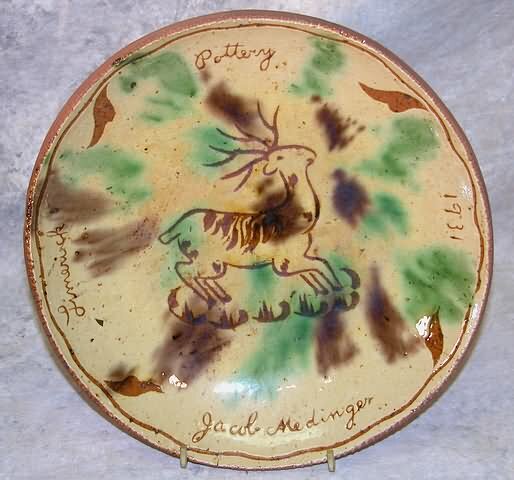 Because of his faithful adherence to traditional methods and decoration, today it can be hard to tell the best work of the Medinger pottery from that of Pennsylvania potters working a hundred years before Jacob’s time. By creating these pieces that we now think of as folk art, Jacob Medinger has become known as one of the finest Pennsylvania German revivalist potters and his works are much sought after by collectors and museums throughout the country. Reference note by p4A editorial staff, October 2011.